The brush-tailed possum is a term that describes a variety of different marsupials, all from the genus Trichosurus. All of these possums are Australian natives, and can be found throughout the continent. These five distinct species are the common, coppery, short-eared, mountain and northern brushtail possums. The common brushtail possum (Trichosurus vulpecula) is not a rare sight in Australia, and lives in areas all throughout the vast nation, including the Northern Territory, Queensland, Tasmania, South Australia, Victoria, Western Australia and New South Wales. They are not exclusive to Australia and also occasionally live in neighboring New Zealand. In terms of habitat, these nocturnal possums generally live in heath, woodland and forest environments. They also sometimes live in city and suburban areas. 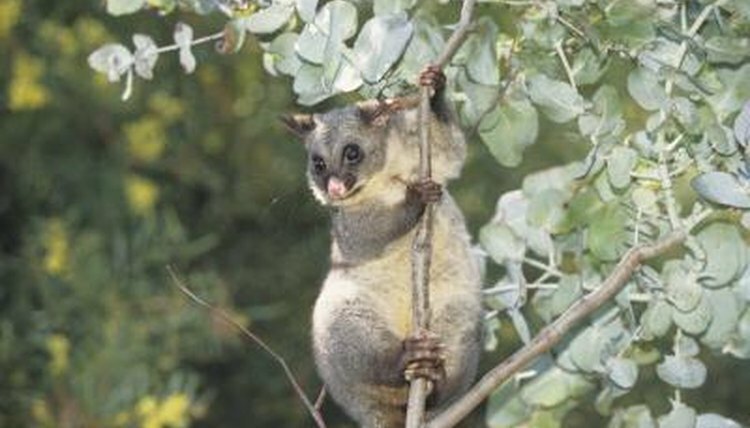 Common brushtail possums usually are roughly 22 inches in length. The coppery brushtail possum (Trichosurus johnstonii) inhabits the northeastern region of Queensland in Australia, often on the outskirts of rainforests. Their fur is a blend of copper and red, hence their descriptive moniker. Coppery brushtail possums usually are somewhere between 16 and 19 inches long, according to Animal Diversity Web of the University of Michigan. These foliage eaters lead independent and reclusive lifestyles. The short-eared brushtail possum (Trichosurus caninus) is a black or deep grey possum that has a thick and sturdy physique. Short-eared brushtail possums are prevalent in the southeastern part of Australia -- the only place they live. As far as habitat goes, they take up residence in closed and open forest environments. Short-eared brushtail possums usually are around 20 inches in length, according to the Queensland Museum. The mountain brushtail possum (Trichosurus cunninghami) lives in Australian's southeastern region, in Queensland, New South Wales and Victoria. These pale gray animals often live in damp sclerophyll forests. Mountain brushtail possums usually are between 32 and 37 inches long -- bigger than other members of their genus. The northern brushtail possum (Trichosurus arnhemensis) lives on Barrow Island, in Western Australia and in the Northern Territory. In terms of coat color, northern brushtail possums usually are gray, although they also appear in deep brown, copper and reddish brown varieties, as well. They generally live in woodland and forest settings. Typical body length for these possums is in the ballpark of 14 to 22 inches.